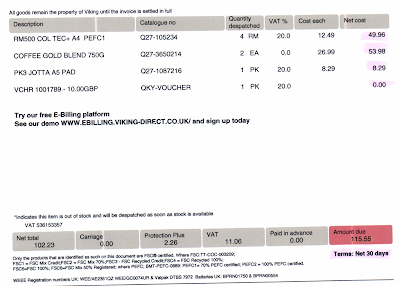 This is an invoice from Viking (Office Depot International (UK) Ltd). I am at a loss as to how it is worked out. The items are simple, there are £58.25 of items with 20% VAT and £53.98 of items with zero VAT. There is also a phantom £2.26 "Protection Plus", which I have no clue about and no idea if VAT applies or not. The items are not clear whether they are quoting VAT inclusive or exclusive, as neither way do they add to the stated NET total of £102.23. VAT of £11.06 is not right on the VAT listed items, whether they are VAT inclusive or exclusive and whether the £2.26 has VAT or not or whether it is VAT inclusive or exclusive. Basically, I cannot find a way to make it add up at all. Any maths or accounting genius out there that can explain it to me? P.S. Their customer service number is an expensive 0844 number which is a problem under current legislation! The voucher line is a discount. £49.96 + £53.98 + £8.29 - £10.00 = £102.23 (net total). Good, I had just about managed that but still got stuck as (1) we did not have/use a voucher, (2) it lists as an item we have purchased for £0.00 but no voucher was in the box, (3) it lists as £0.00 not -£10.00 on the itemisation. And finally, even if you do that I still cannot make the VAT total work any way I try, especially as the voucher is listed as 20% VAT rate. Or more fun to use the legislation to require them to refund the cost of calling the expensive number maybe. Perhaps one day when I have spare time (LOL). Unless the invoice was made out to you (not the company) you won't be able to sadly ... the regulations apply to Consumer contracts, leaving B2B suppliers free to extort other businesses by forcing them to call PRS numbers. Wow! Email the office and claim your free cuddly dragon! Of course, they list the voucher as 20% VAT, and we did not actually have/use a voucher, but it probably is what they have done. I was just about to post and say no idea how they got those figures so well done Tom - Still not sure how or why they did it that way. Would love to hear their explanation!! I am writing to them! Tom is right and as far as I am aware, what they have done is the correct VAT treatment. Essentially, the £10 discount applies to both the VATable and non-VATable items, so they have apportion the £10 discount voucher to both types of item to work out the correct net amount on which to charge you VAT. 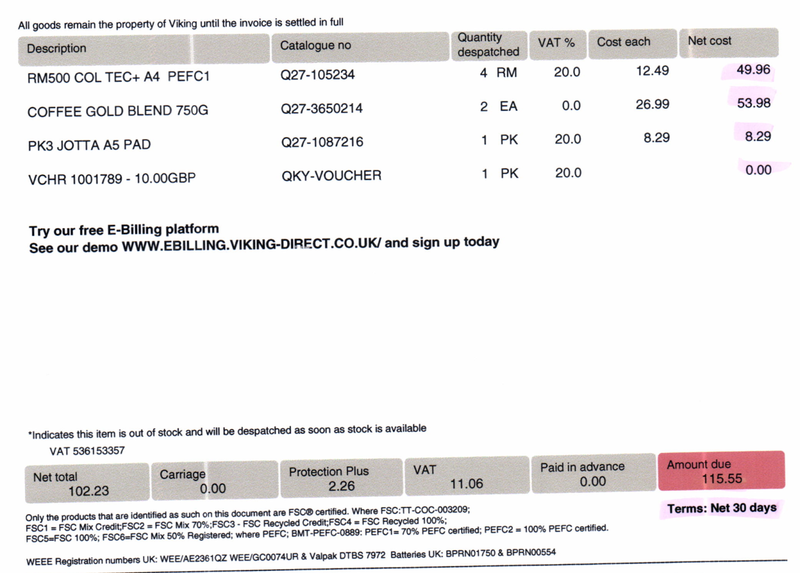 If they had offered the £10 discount on just the VATable items, then the VAT amount would have been reduced further. Protection plus at £2.26 is then a fee for a service they have added on top of the final bill, so this is also subject to VAT. Protection Plus is a sneaky extra they add on - gives you a 12 month return policy on eligible items. They pretty much auto-add it so you gotta look for it when checking out. That is another story entirely. I think the confusing bit is that the £10 has the 20% VAT next to it, so any reasonable thinking person would assume that this is £12 in total deductions. IMHO and for clarity it should be split out to show this! It provides you with a 12 month no quibble returns policy, for a small extra change. 'Protection Plus' is 12 months accidental damage cover. Just in case your writing pad falls off the desk and breaks, I guess. I wonder if you could claim you accidentally drunk all the coffee? This is the perfect and I believe that you will be able to have the perfect things because your score is already the best one.